This year, organise a bespoke team building day which will leave your employees with a lasting feeling of achievement and unity. We will get them pushing their limits, leaping from rocks into the sea, encoraging each other and working as teams to paddle our giant SUPs along the coastline through caves and gullies. Swim, scramble and jump along the coast with this high adrenaline activity - perfect for people who like to push their limits. We offer a wide array of jumps, ranging from nursery rocks a few feet high, leading up to exhilirating jumps of around 10 metres. 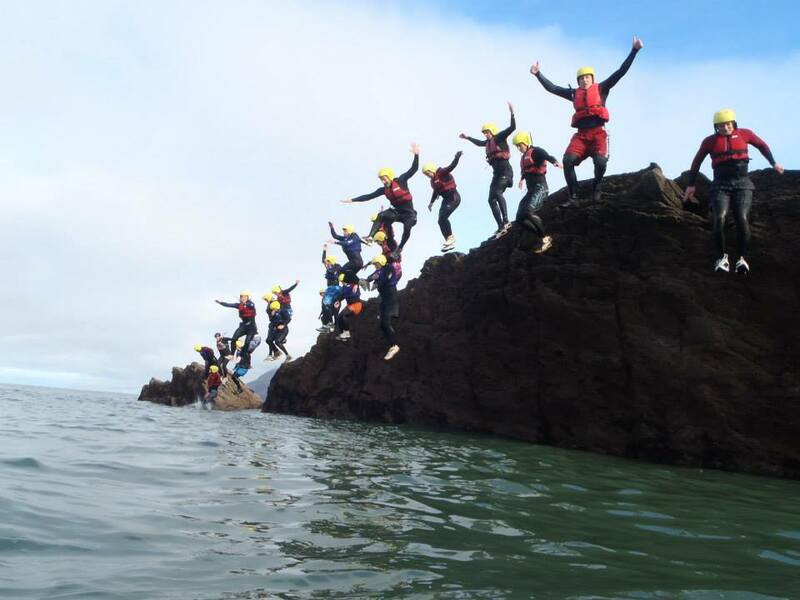 We assure you there's a challenge for everyone with coasteering! 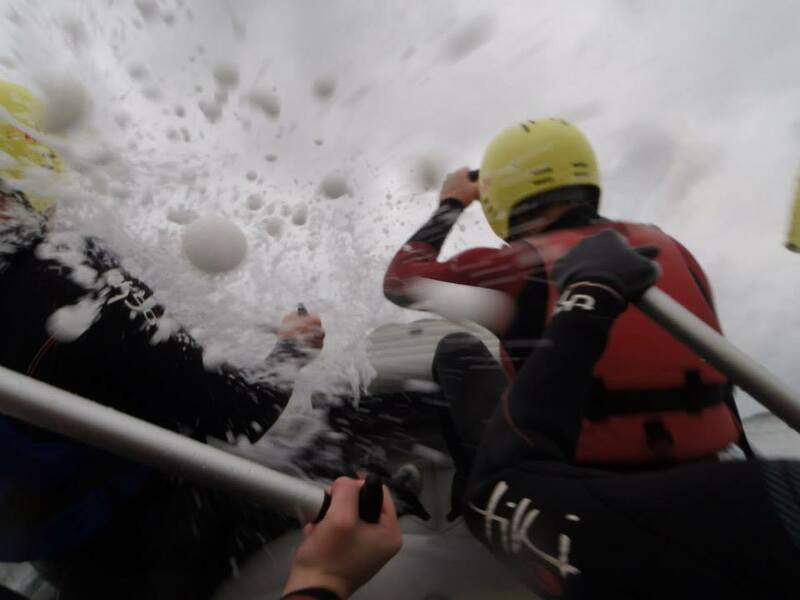 Working together as a crew on our rafts, groups will paddle around our amazing bay, through gullies, exploring caves, and finding hidden coves. They'll have the opportunity to visit a secluded beach and make their own fires with a flint-and-steel. 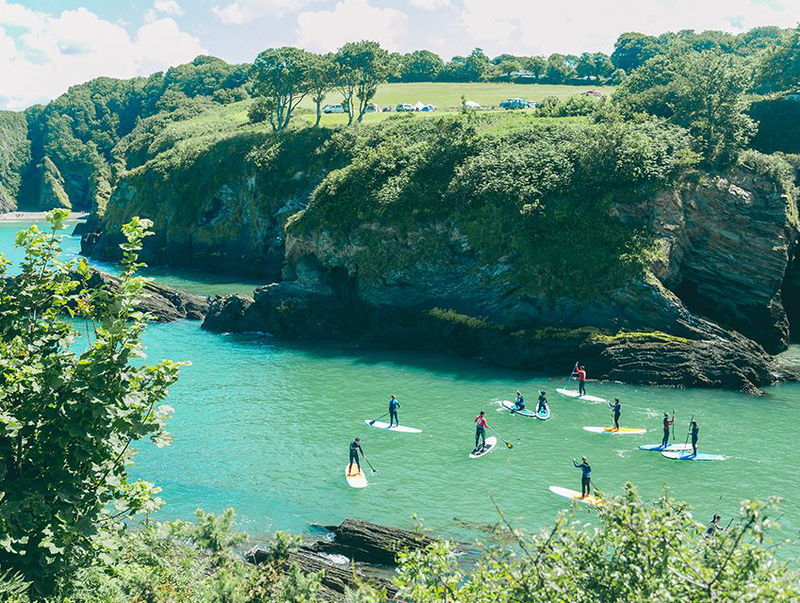 Similar to the Raft activity this involves paddling along the coast and firelighting however SUPing takes slightly more skill and coordination as everyone must stand, balance and paddle together in order to successfully SUP! We've found with large groups that taking our two Giant SUPs and two Rafts out, swapping about and having a play with both works great. We want to create a bespoke day plan that suits you and your employees perfectly, so if you're interested in multiple activities then give us a call and we can put together a day you won't be forgetting any time soon! Having over a decade of experience in outdoor actvities, we know how to deliver the challeging and adrenaline packed day you are looking for. Coporate groups who've already enjoyed successful days with us include: Ernst & Young, Lloyds Bank, Royal Marines, Royal Army, Ventia, Stil and Clarks. Our HQ is in Watermouth Cove, Ilfracombe and it’s our most popular spot with exclusive access to a stunning private coastline and caves (not to mention the hot showers, bar and changing area). 8 very happy adventurers spent an amazing few hours with Active Escape - even those who approached the day with trepidation had an awesome time.